Happy Hump Day everyone! Today I have all things ski related on my mind, as this weekend I'll be making my first ski trip of the season. As many of you may know from reading this blog, I am frequently traveling to Killington, Vermont, as my mom lives there, but I only make it out on the slopes about twice a year. Because of the little amount that I actually ski, I haven't bought a new ski jacket in years, and still use my parka that I had in high school. (Hey, it just goes to show that a classic will last you many years, plus I'm proud of the fact that it still fits!) However, I do have an itch to update my ski wear, and am eyeing this Spyder jacket. Whether you hit the slopes or just want to sip cocktails by the fire, a great sweater, and snow boots are essentials (you'll even be wearing your snow boots out for dinner and drinks, so no fancy heels). Because I'm always cold, I like to layer with a soft turtleneck, and of course I don't go anywhere without a great pair of sunglasses. Lastly, the cold weather and high altitudes don't help my already dry skin, and this Clinique Moisture Surge lotion has been a life saver. I can't say enough good things about it! I want to go skiing so bad, and I want to do in these pieces. I've literally never been skiing before, which might be a good thing because I expect I'd be an awful klutz! Loving that patterned black and white sweater. 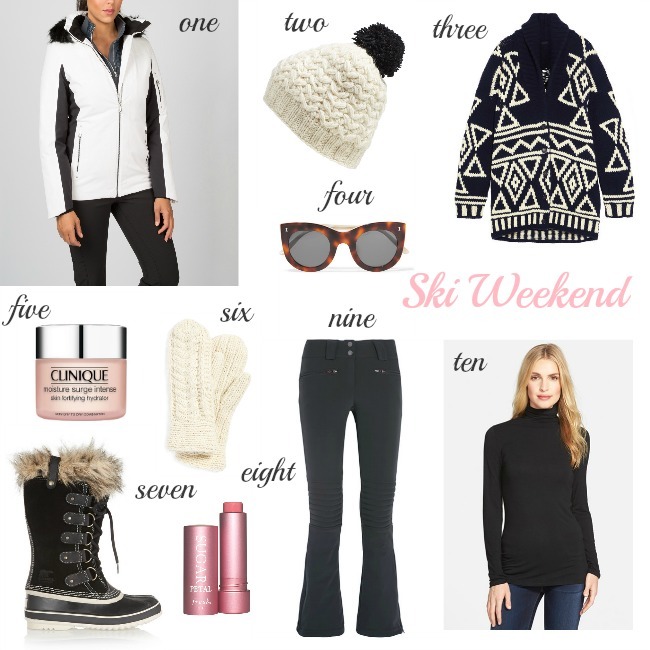 Wonderful picks, these are perfect for a weekend ski trip! You should totally be proud your jacket still fits! That cardigan + the beanie, obsessed! have so much fun! Omg I'm swooning over all of this winter gear! That beanie is the cutest! Have the best time! Can't wait to see your snaps! I have never been skiing and my kids want to go to a fake snow ski place... I always sort of ignore them when they mention it. Ha, ha. Maybe next year we will go and I'll look stylish like you! :) I really love that cardi! That cosy cardi looks great, love the print and it would definitely be warm! Great pick, I love Sorel! OMG so jealous you went to ski. I have never gone skiing in my life but I definitely want to. I need a pair of Sorel boots. Totally swooning over the cardigan, beanie and sunglasses from your list too. A great list for a skiing getaway. I love Clinique's products so I bet that lotion is great!